Climate change experts accept that reducing greenhouse gas emissions – even doing so substantially – won’t be sufficient for limiting atmospheric warming to the 2°C (3.6°F) goal of the Paris Climate Agreement. And with carbon capture technologies years away from maturity and widespread commercialization, one option is to take advantage of proven nature-based systems for sequestering carbon. That is the central message of a widely discussed recent article in the journal Science Advances. America’s trees, soil, and wetlands each year capture around 11 percent of the nation’s emissions, according to EPA. The study’s researchers calculate that they could be harnessed to sequester up to 21 percent of net annual emissions of the U.S. . 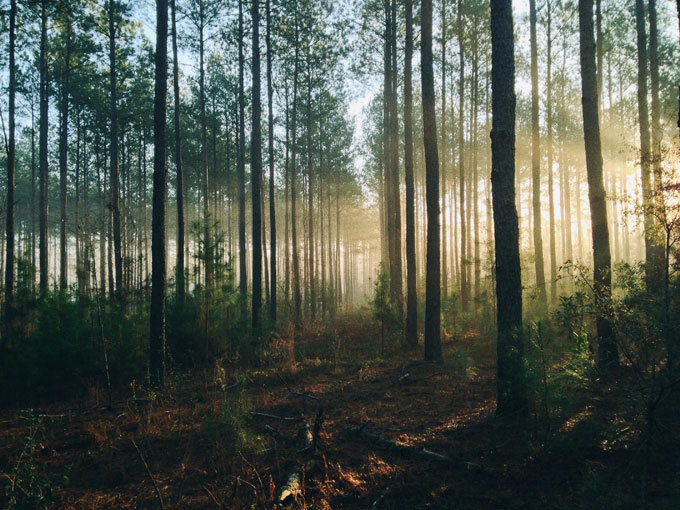 In particular, the study authors identified reforestation – replanting historically wooded settings that no longer have forests – as the natural solution with the most potential to capture additional carbon. 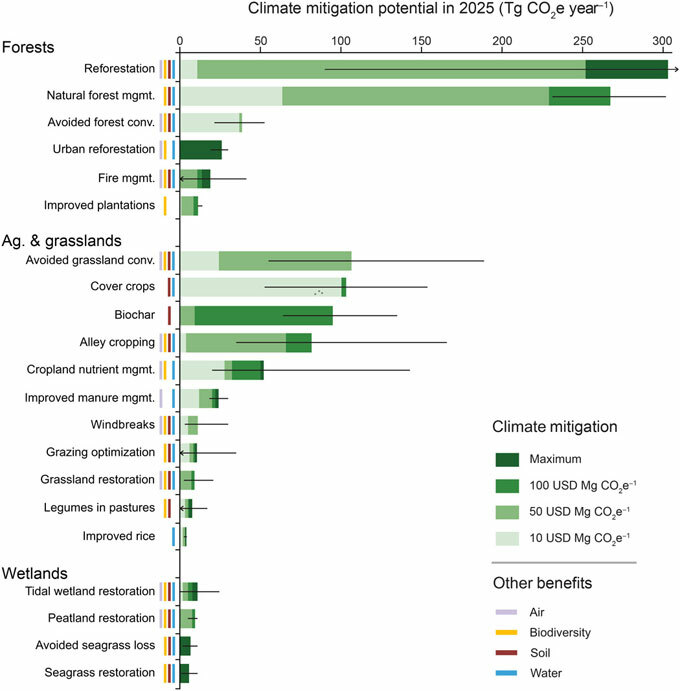 They found that actions like improving tree plantations, managing cropland nutrients, and restoring tidal wetlands also offer promising mitigation opportunities, but on a much smaller scale. Since publishing the research last fall, Fargione said in a phone interview, he’s heard from people curious about ways to reach reforestation’s climate mitigation potential. His response: Carbon pricing is an important part of the solution, but co-benefits could also spur action. A survey of The Nature Conservancy’s reforestation work showed that much of it is associated with water quality co-benefits. For instance, planting trees after a forest fire helped prevent drinking water contamination in Santa Fe. Susan Cook-Patton, a co-author of the Science Advances paper and Fargione’s colleague at The Nature Conservancy, has spent much of the past year working to help state-level decisionmakers decide which reforestation opportunities make the most sense in their unique circumstances. Her work builds on a map of re-forestable land that was developed for the natural climate solutions study. To create the map, researchers used government data sets to identify historically wooded areas around the U.S. where trees have been lost, then subtracted settlements, roads, and food-producing land to avoid conflicts with critical human infrastructure. Her current project aims to develop toolkits of different data layers that states can use to analyze potential reforestation sites, taking into account cultural and social variables in addition to ecological and financial considerations. He also sees movement at lower levels of government. American Forests is working with The Nature Conservancy and other groups as part of the Natural and Working Lands initiative of the U.S. Climate Alliance, which helps states scale up their climate actions. As the 22 member states formulate their plans, reforestation has emerged as a priority, and a number of creative strategies are being developed to fund it. “I think we can really count on these states to be rapidly ramping up and becoming real drivers for reforesting America,” Daley said. ‘… really our only hope’? One frequently raised question is whether reforestation might create new carbon sources if wildfires, drought, or other climate-related threats damage young trees. This line of reasoning is flawed, said Joe Fargione. Reforested lands hold only a small portion of the carbon already contained in the landscape, all of which is at risk as the planet gets hotter. But a major reforestation initiative would reduce the chance of catastrophic warming occurring in the first place, he maintains. Experts now understand how to make forests more climate-resilient by means of improved tree selection and planting techniques. But for Fargione, the issue comes down to more a fundamental concern.